Lakhisarai Judgeship was established on 20th September 2014. Lakhisarai Judgeship was inaugurated by the Hon'ble Chief Justice of Patna High Court Sushree Rekha Manharlal Doshit in the presence of Hon'ble Inspecting Judge of Judgeship Munger Mr. Justice Ahsanuddin Amanullah, Judge of Patna High Court. Sri Ram Shreshtha Roy is the 1st District & Sesions Judge of Lakhisarai. Sri R.S.Roy joined on 20th September 2014 and Present District Judge Sri Madan Kishore Kaushik is the 2nd District Judge in succession. Before establishment of Judgeship Lakhisarai the Sub divisional Judiciary court was established at Lakhisarai on 2nd of May 1987. The Sub- Divisional Judiciary Court, Lakhisarai was inaugurated by Honb'le Mr. Justice Sri Lalit Mohan Sharma Ho'ble Judge of Patna High Court. 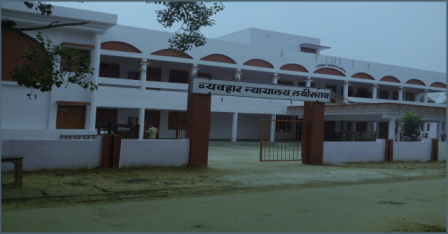 Sheikhpura Sub Divisional Judiciary Court is carved out from Lakhisarai Judgeship on 13-04-2015 and became separate District court. Noted Historian Dr. D.C. Sarkar during his visit, found some more evidences on the basis of which, he also confirmed that this place was very important "Krimila" Subject during Pal administration. Monument of Madan Pal of period 1161-1162 was found in Balgudar consist Narayana statue as Krimila Subject. Chinese traveler Huen Tsang described this place having 10 Buddha mathas and more than four hundred Buddhists resided here. Most of the Buddhists living here were Heenyanis. There were 10 temples also of Hindus and people lived here with peace and harmony. People of that time used to live in a very planned manner. Also, according to historian Sri Radha Krishna Chaudhary all the Buddha mathas were situated in southern side of Ganga and the king of Pal Bans was also a Buddhist. This region of Lakhisarai was ruled over in seventh century to eleventh century by the administrator of Pal Bans. Sen family also ruled this region for some period in 11thcentury. Acharya Hawaldar Triapthi mentioned this region of Lakhisarai on the basis of "Mritika Mudra" kept in Nalanda. It means that Krimila was very important and Caval Gram was very important. The people believe that Krimila of that period is now Kiul Basti, which is situated in Southern side of Lakhisarai Railways station. Krimila was a center of Buddhist religion. Lord Buddha also stayed here for three years on Chaliya Mountain and Jantugram was nearby Chliya mountain and was situated on bank of river Krimikala, where Lord Buddha with his followers used to visit and deliver speech. It is convincing that Krimikala is now in Kiul river and Chaliya mountain is nothing but Jainagar mountain. History indicates also that Md. Bin Bakhtiyar attacked this region in 11thcentury. Shershah also ruled this region in the 15thcentury. Surrajgarha witnessed great war of Shershah and Mugal emperor Humayu. Also a fight occurred in Fatehpurnear Surajgarha between Miya Suleman and Adlshah in which Adilshah was killed. As per advertisement no. 01/16, a list of 36 successful candidate’s along with list of 18 wait listed candidates for the appointment of Peon/Orderly in the Judgeship of Lakhisarai.